“We Care for California” Day Rally. 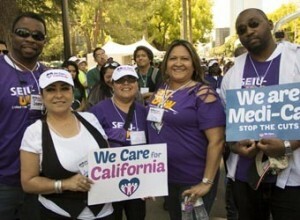 “We Care for California” Day was the largest healthcare rally in California history. 8,000 healthcare workers from across the state joined with doctors, nurses, hospital administrators, and community supporters at the Capitol to call on Governor Brown and the legislators to stop $1 billion in planned cuts to Medi-Cal. Let’s Get Healthy California! In 2012 we put the health back in healthcare. California homecare workers turn up the heat ahead of state budget deadline. Over 1,500 home care providers and consumers gathered together for two weeks of actions to let legislators know that they would not stand for any additional cuts to the In-Home Supportive Services (IHSS) program. State Worker Unions Rally to Demand Pay Raises from Gov. Brown (Capitol Public Radio). A top California union leader says “the fight is on” now that Governor Jerry Brown’s administration has rejected state worker pay increases in contract talks. The union’s new tough talk comes against a Democratic governor they’ve long supported. The State Worker: California state workers rally for pay package (Fresno Bee). Several thousand purple- shirted state workers took over the Capitol’s west side Wednesday for a SEIU Local 1000 union rally that was equal parts picnic, party and protest. They danced. They chanted. They ate lunch in the shade at Capitol Park. And they complained about their pay. New safety alarms for Napa hospital workers. In response to pressure from members, the Department of State Hospitals (formerly Department of Mental Health) has agreed to allow workers at Napa State Hospital to wear their new personal alarms on their belts instead of around their necks with lanyards. “We are finally seeing some of the safety changes implemented that we have fought for,” said Kim Cowart, a nurse at Napa State Hospital and chair of Bargaining Unit 17. Congratulations to: Patricia Reynolds, Registered Nurses Industry Council Chair, and David Fleming, San Francisco City and County, Executive Board: County Area Representative. About 80 RNs Join 121RN So Far in 2013. 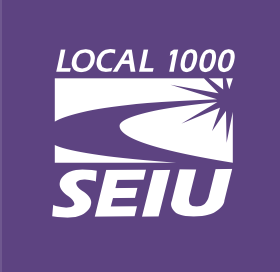 By a blowout margin of 3-to-1, about 50 Registered Nurses at College Hospital Cerritos voted to join SEIU 121RN. Welcome to our Facebook page! Local 221 nurses work across San Diego County and provide a host of essential services to the public. This article features a profile of the jobs of Detention Nurses at the San Diego Central Jail. The Time is NOW for Commonsense Immigration Reform. We deserve an immigration system that benefits our economy, reflects our values, and makes sense. The Answer: Tax the Rich, by Virginia “Ginny” Anders-Ellmore, L.A. County Nurse Practitioner. Inland Members Honored for Making a Difference. Registered Nurses Elena Maher and Elizabeth Uher who helped save an inmate’s life at the Indio jail, were among several SEIU 721 Inland Area members honored by the Riverside County Sheriff’s Department on Wednesday, April 4, 2012.